We are pillow lovers! And we use them to decorate liberally. We are thrilled as the seasons change because that means we are on the hunt for beautiful pillows and pillow covers to celebrate what is happening outside our front doors! Yes, it’s that time again… another edition of pillow love! 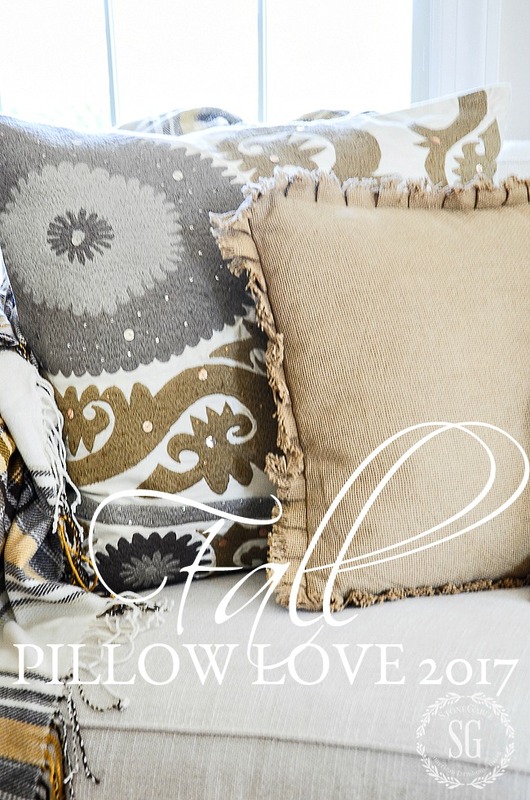 FALL PILLOW LOVE 2017! I’ve searched the web for the best fall pillows for you! Let’s take a look! You can listen to any or all podcast episodes HERE. This fall I’m putting together a more sophisticated, nod to fall look. Not so much fall pumpkin pillows. I will miss them this year, but there is always next year! Changing up decor is something I love about decorating! And it’s really very easy! Changing just a few key items can give you an entirely different look! This year I’m using beautiful grays and deep stone ground mustards and graphites. They will work wonderfully with my neutral rooms! 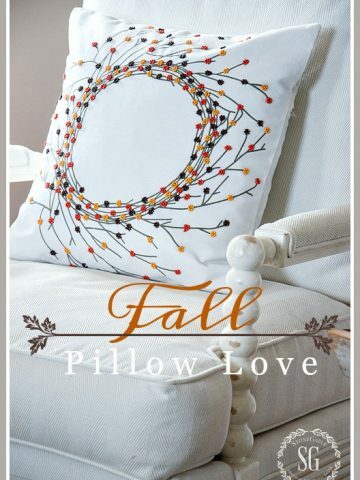 The inspiration for fall decorating was this gorgeous 24 x 24 inch embroidered pillow from Pottery Barn. I fell in love with its rich colors, embroidered texture, and interesting tribal design. This was the jumping off point for my fall decor! 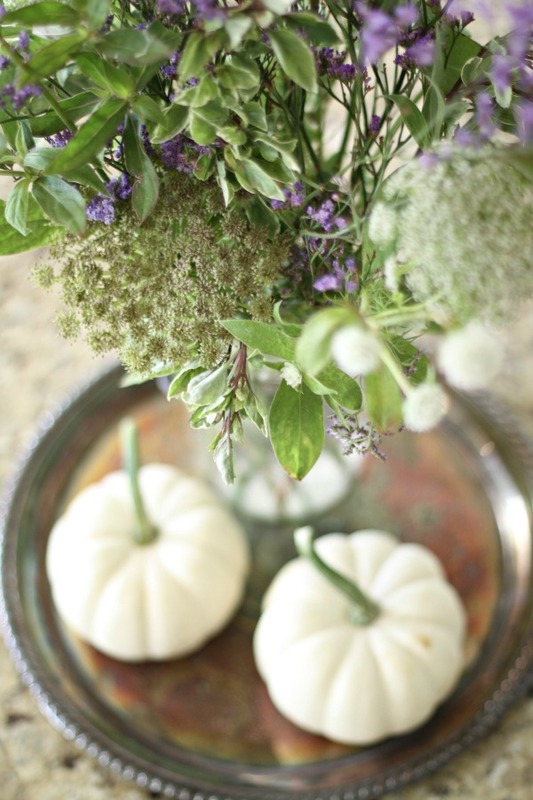 Not all fall decor has to have pumpkins, corn, and acorns on it! The rest of the pillows did not come as easily as the Suzani pillow! I found the mustard ruffled pillow at a local shop, and the gray and ivory pillows at Pier I. Because the Suzani pillow was so bold I kept the other pillows solids. Their great texture spoke loud enough! Notice the beautiful soft chenille fabric with the herringbone design on the gray pillow. Beautiful pillow! See it HERE. I must admit the ivory lumbar pillow was a splurge. I fell in love with it! It’s so so textural and beautifully made!!!! It could work in every room in my home. And because most of my pillows are square, this little gem will work in front of other pillows too! 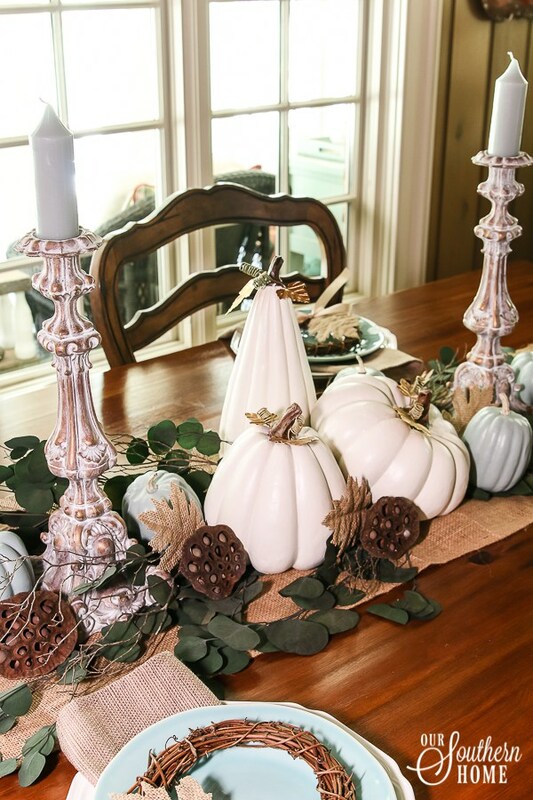 It came from Pier 1 and is part of the Magnolia Home collection. See it HERE. Look at the texture! Sigh! Before we begin I know I’m going to get questions about the deep gold pillow with the raw edged ruffle. I’d love to tell you can get it online. But you can’t! I found it at a local shop. Oh, I wish they had a website! 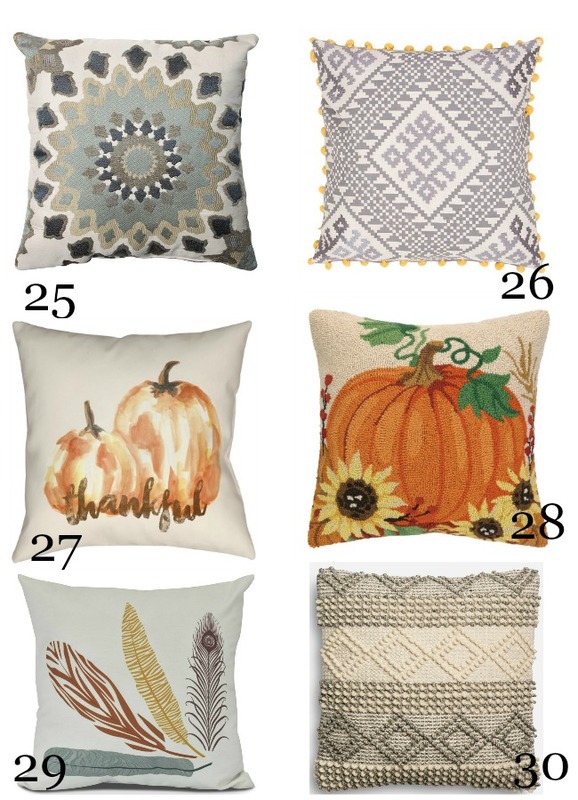 Here are some wonderful pillows I’ve found for fall 2017! I’ve paired up a few that work together well! I also like 1 with 6 and 3 with 5. Actually 3 with anything. It’s so important to buy what I like to call “foundation pillows”. These are pillows that can work with almost anything you put them with. 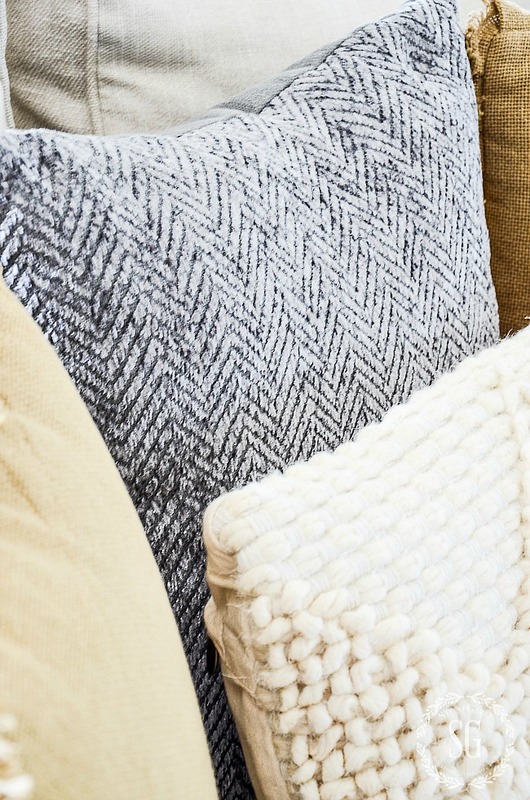 When thinking about putting together a group of fall pillows don’t just pick those with a seasonal motif, make sure they are supported by textural and solid pillows that work with them! Think about 6 and 9 together or 8 and 11 (yes, it appears twice- I love this versatile pillow). How about 5 and 10 on a sofa for a bright pop of fall! And 3 with 8 for a softer fall look! I like a trio of pillows and many of these would work together! Here’s more of my favorites! 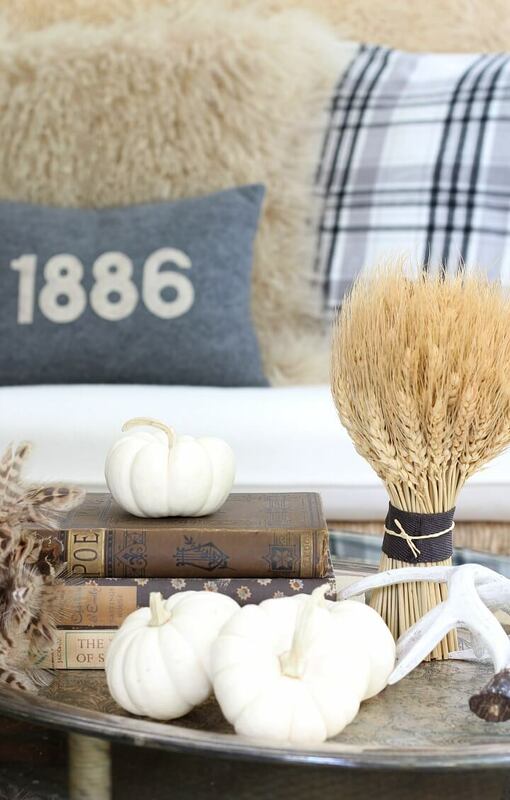 Think about using pillows that don’t have fall themed motifs. 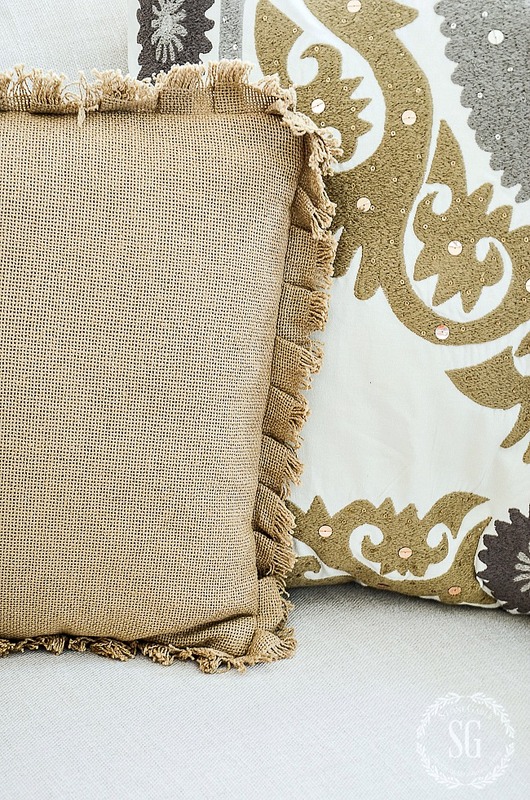 These pillows should look warm and have a pattern that works with your decor. I adore #25 and 26. Gotta get them for fall! I think #29 is so on trend and cheeky! LOVE the stylized feathers! I always say, “Pillows are like jewerly for your home”! Accessorize for the season, friends!!!! The Love To bHome Fall Tour is going on this week. Stop back tomorrow and you can see the back half of my home decked out for fall! 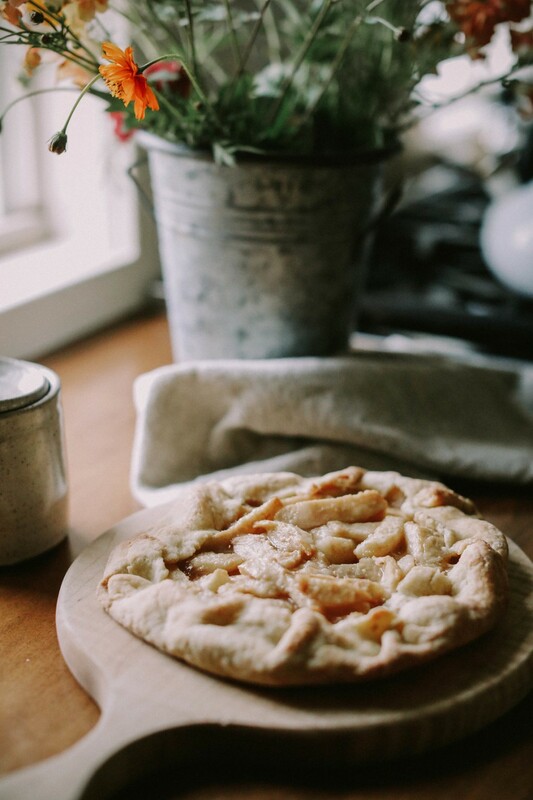 You might like to follow me on Pinterest and see what I’m fining to pin every day HERE. Fall is my favorite time of the year. Pinned and very inspirational. Too many good ideas but on my boards for next year. Fun post from beginning to end. I love the 10 minute tips and tricks on the pod cast today, you girls rock! Please enter me into the drawing. Such lovely pillows! Great combination, guess I should start my shopping! Yvonne, you have such a gift for color. Your pillow combinations are just beautiful. As usual you’ve knocked the pillow out of the park. Oops…pillow suggestions is what I was trying to say. I am catching the pillow bug. They are all beautiful. I love #4 the trio of oumpkins lumbar pillow. It looks to me like it is hooked and I love the texture. As always your decorating is inspiring. 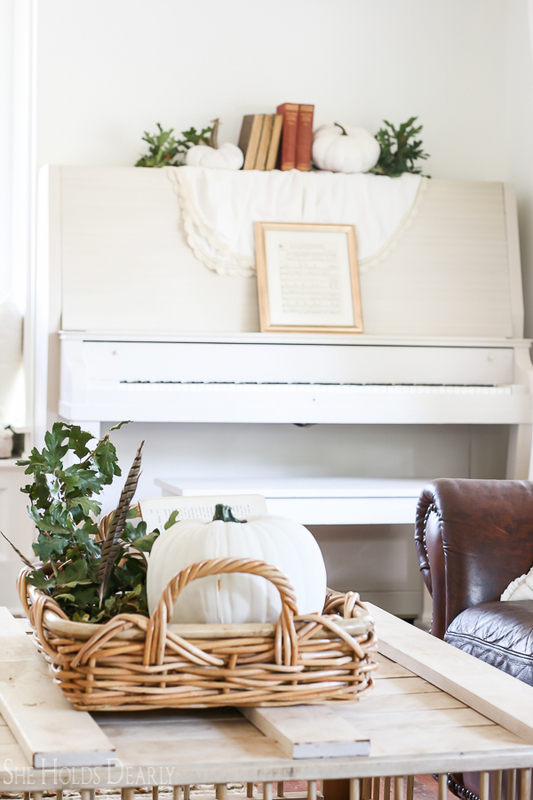 I wanted to keep my living room colors of blue and white but incorporating fall accents. I ordered two pumpkin pillows from Pier 1, with shades of blue and gray, added white velvet pumpkins and gold silk ones, and it looks lovely! Love all your tips!! Love Pottery Barn pillow covers. Such lovely pillows, wow, they are all great! Hi. I happily admit that I have a pillow fetish. I do need some advise though. What’s the best way to store them? They are all lovely but I’m partial to the neutrals. These are absolutely inspiring! Thanks for the matching suggestions. Very helpful for those of us who need help thinking outside of the box when mixing pillows. Yvonne, you’ve done it again! And my husband is going to kill me because I’ve taken the lead you’ve established and purchased some beautiful pillow covers for fall. I must admit, I am addicted! I do have a question for you…where do you store your pillows that are actual pillows? My master bedroom closet is now dominated by pillows I need to store. I won’t be able to keep them there forever. My husband is not too thrilled with me storing things under our bed because we have hardwood floors now, not wall to wall carpet. I would welcome any and all suggestions! Thanks for another great post?? Storing pillows can be a bit tough. I have a cedar closet in one of my guest rooms and put the pillows in there. If I buy a pillow and the cover can be removed I do that and keep them folded in the chest in my living room. 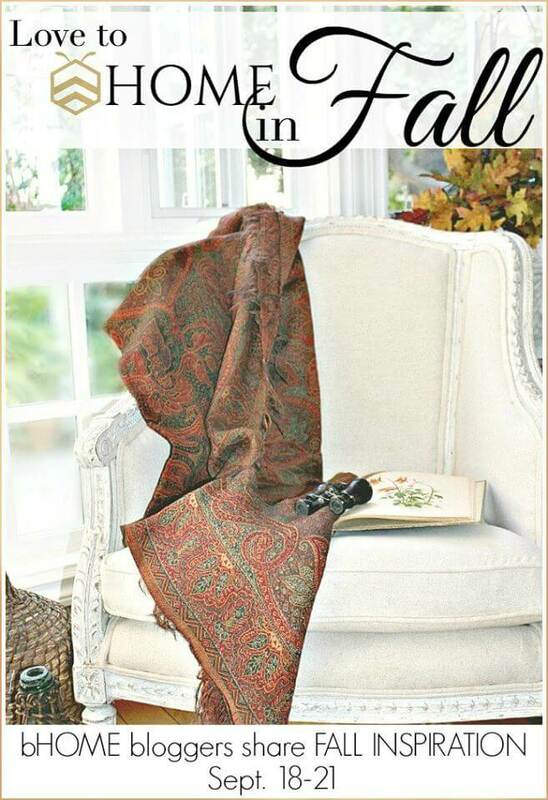 Kohl’s has some fall placemats that I want to make in to pillows and would cost less then buying fall pillow already made. What beautiful pillows! Great ideas for my new sofa that arrived yesterday! 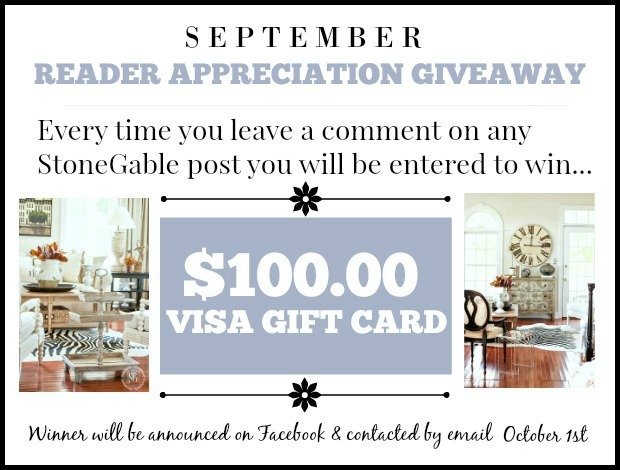 I can’t wait to choose some of your beauties! A new sofa? How fun! 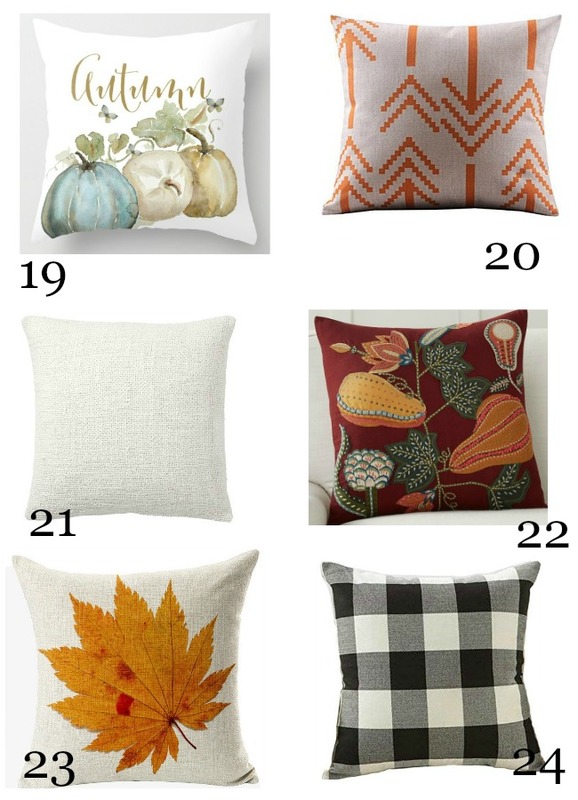 I’ve been looking for new fall pillows Thanks for all the suggestions. I love your decorating style! I really love your pillow posts Yvonne! You always share such nice pillows and combinations of pillows that would look great in my home. Happy Fall! Had to smile at your comment about the gorgeous gold pillow with the wonderful textured ruffle — it’s the first one that caught my eye and that I lingered over! I’ll be looking for a nubby linen to make a replica! 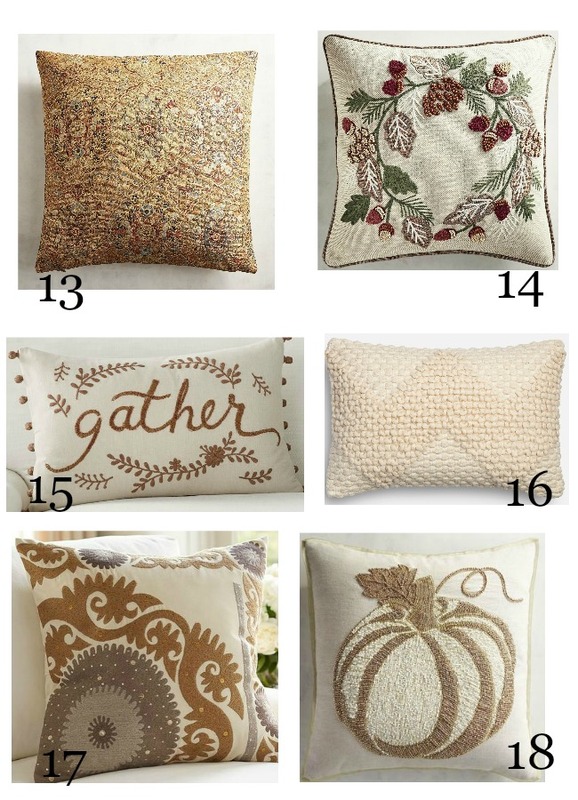 Really enjoyed the array of fall pillows you assembled – way too many choices! I really like the pop of fall colors like the orange of Pumpkins! I love pillows too but the neutral color scheme leaves me cold! I totally agree, Judy! What’s Fall without the orange of pumpkins?!? I love pillows! They can change how a room looks, either a couch or chairs. A few years ago I was wise enough to purchase a creamy beige sofa. Now I can switch out pillows and throws to suit the season. You have great picks! So many pretty pillows! I especially love the embroidered acorn wreath. Looks like it could be kept out for winter also. I love pillows too and use them all the time even though my husband doesn’t like them and thinks there silly!!! 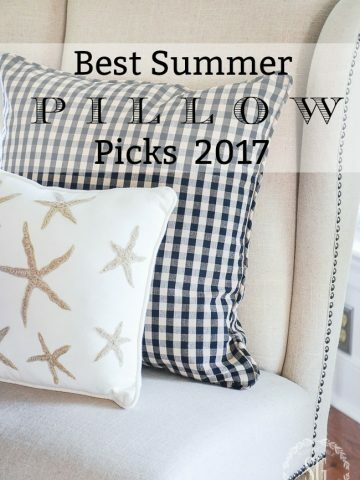 You always find the best & most affordable pillows/pillowcovers! Thanks for sharing! Where did you find your throw? 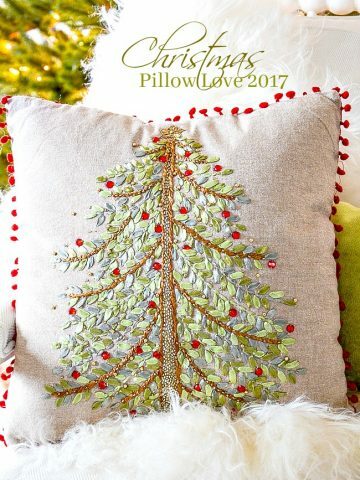 Thank you for sharing such beautiful pillows and where to buy them! I so appreciate knowing where to buy an item! 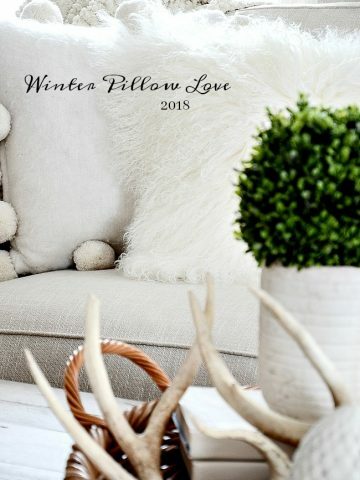 I never did pay slot of attention to pillows until I started reading your blog… now I’m learning how to make some seasonal changes with some basics included! 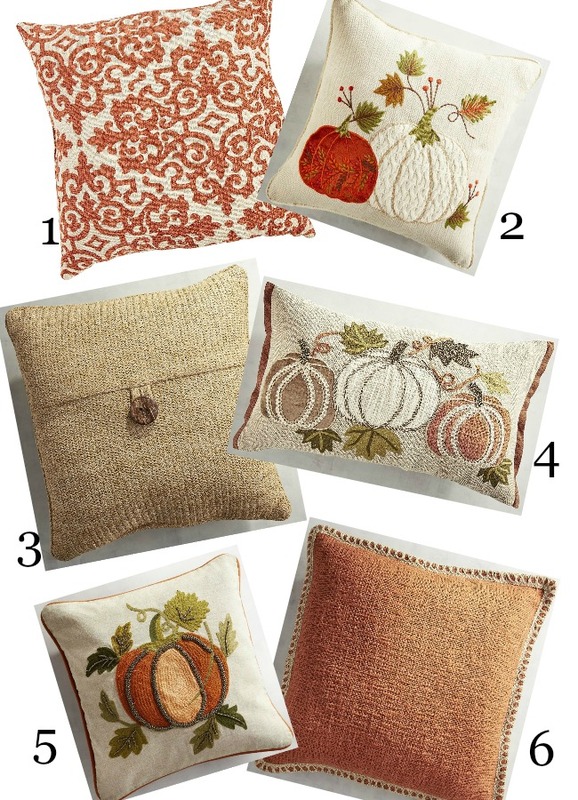 Yvonne you have done a wonderful job at putting together such a fine selection of fall pillows for today’s post. I love your new pillows and all the textures. The lumbar pillow is my favorite. Have a great day! What beautiful pillows! I could pick out so many of those and put them in my rooms. I must take a trip to Pier 1 and bring my credit card along! I just love pillows and the texture and color they provide. Your suggestions are beautiful and so decorative. Wow, so many pretty ones to decide on! I think #19 is my favorite, and what a price! Thanks for putting this together, Yvonne. 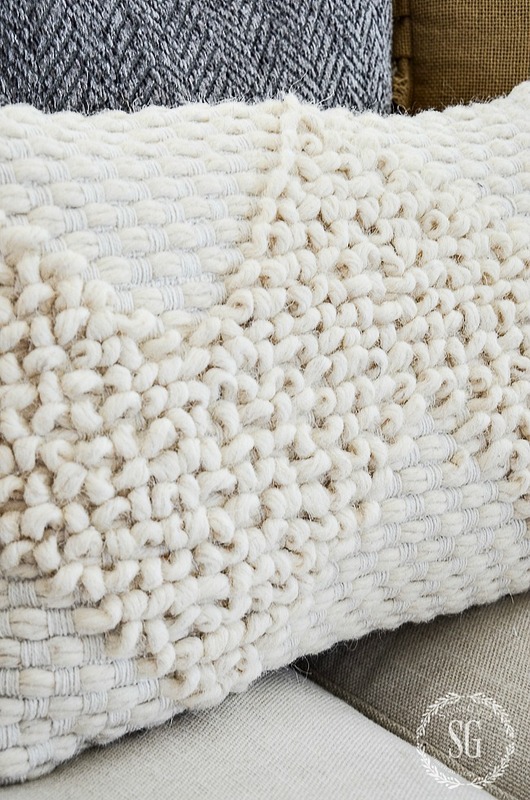 Love all the pillows, especially those with texture! Great choices, Yvonne. Thanks for encouraging this reader to invest in seasonal pillows. Such an easy decor touch. I currently have 2 pumpkin and 1 new neutral. Also, was gifted a homemade machine embroidered one with beautiful velvety, intricate design of squares, that is grays, creams and taupes. A dear, talented friend had a sewing machine shop for a time. Having a late August birthday guarantees a Fall pillow gift each year. 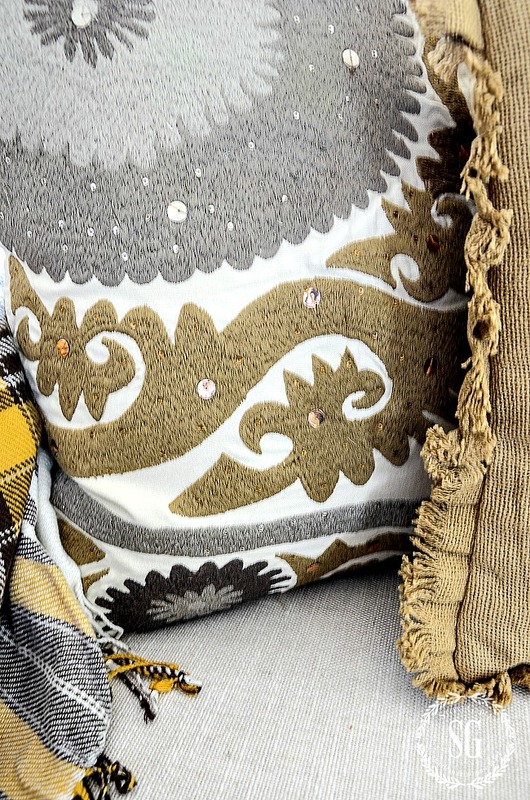 So many pretty pillows….my vote is for the fringed pillow. Yvonne (or any of your readers), could you tell me what the trend for 2018 is regarding kitchens? I have an all white kitchen (Cambria Torquay countertops, white subway tile for backsplash, white painted cabinets with beautiful glass knobs, white walls that are painted bricks and a charcoal gray tiled floor) I am a little tired of all the white but hesitate to add a lot of bright colors. Just wondering what’s new? Thank you for your help. White is a classic, Gayle. It will always be in style but maybe not the hottest trend of the moment and that’s okay! I’m seeing charcoal and black. Also upper cabinets a different color than bottom cabinets. I don’t think I’m that brave! Bleached cabinets are also on the horizon. I see lots of unlacquered brass and stone sinks. I’m also hearing granite is out but I think it is a classic! Backsplashes are getting very creative with interesting materials like embossed metals and natural stone done in creative patterns. I think it’s best to go classic myself. Gutting your kitchen to get the latest trends is a very expensive and fickle endeavor! Pillows pillows pillows! I think what I love about them most is how they can completely change the look of a piece of furniture, or a bed, or a chair, etc… and you don’t have to spend too much money. Sure, some are splurges, but it’s fun to check out local shops and discount stores as well. I love the pillows you are showing today! Such wonderful textures and the colors are just fabulous. Love all especially your pairings. Always love your pillow posts!! Thanks for rounding up some fall beauties!! Love your pillow collection – thanks for sharing. Wow what a beautiful assortment of pillows! Can’t even figure out what I like best. Wonderful texture in some of them! I always felt like something was missing in my decor from season to season. You taught us about texture and…bingo! I have learned from you that even the addition of the simplest textural element creates dimension and ties everything together. Thanks for such great information. Happy Fall! Great Shawn!!!! YOU GO GIRL! They are a lot just wonderful! I love your comment that pillows are jewelry for their home! I also love neutrals and your ehite lumbar pillow is just fabulous! The other pillows are also great. I can’t wait to get your daily blog.!!! You always inspire me! I really liked the Carmela pillow that you showed first in your Fall Home Tour, so off I went to Pier 1. 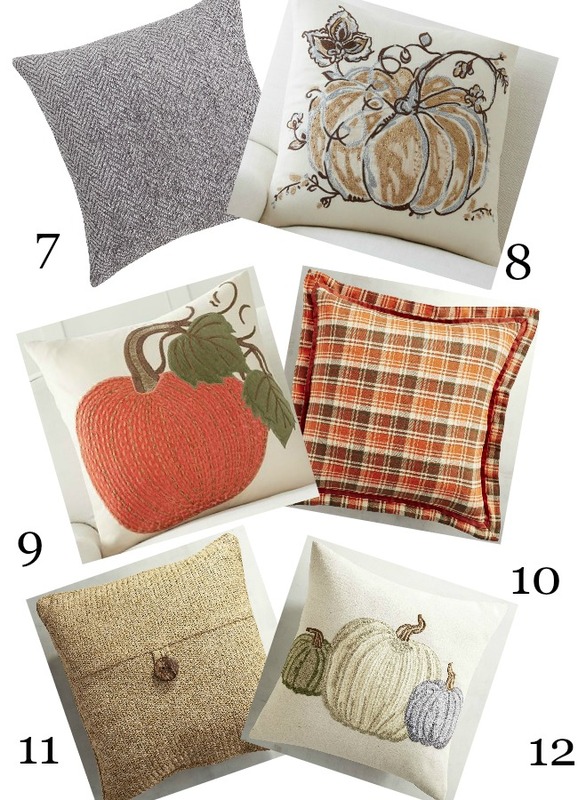 There I found a better pillow for my own decor, and also saw tons of other great fall items. I usually only shop at Homegoods, TJs, and Marshalls, so I’m grateful that your inspiration has led to my broadening of horizons. Now, on to CANDY CORN! What a wonderful selection of pillows! Thank you for doing the legwork and finding such great choices for us! 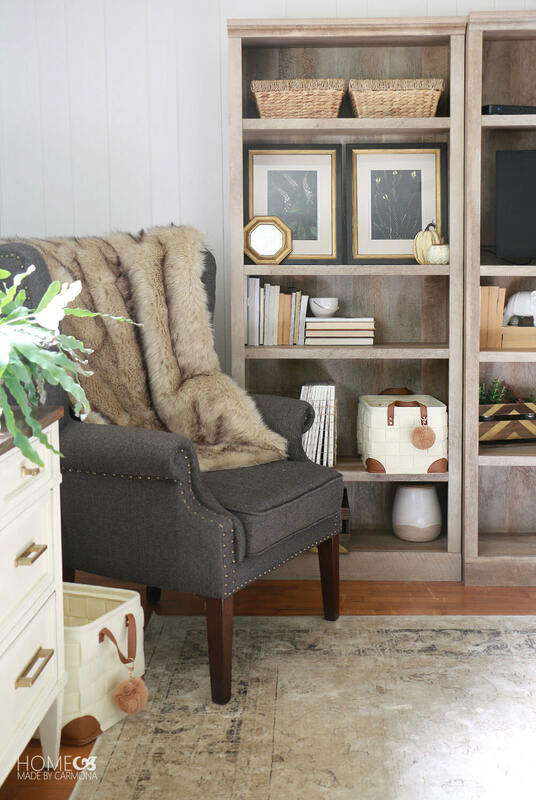 I noticed your yellow/black plaid throw blanket and would love to have the source for it! Yes, I too would like to know where you bought it too. I love the sophisticated fall look! Pottery Barn. Yvonne links to the throw in an earlier reply. And, the price is fantastic!